Mamarazzi have been hunting for Stevia Plant since the earlier two babies did not survive its infancy. 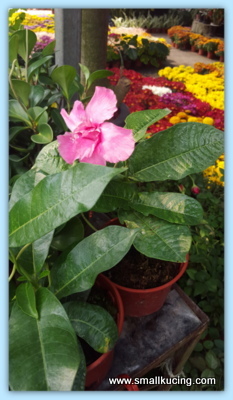 Heard from gardening group that Nursery at Lot 61 in Sg Buloh have it and the plants there are not pricey . She headed there while I was in school. Stevia plant was out of stock. New stock will arrive this Saturday according to the man (staff/owner?) . Hmmm.... RM18 only. She really can't resist and bought it. See the lovely bloom. 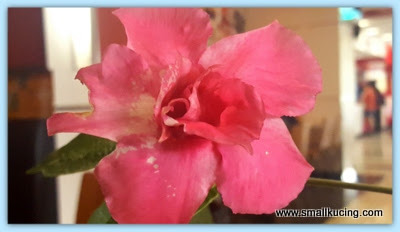 Looks a bit like multi petals Adenium hor? Hopefully this plant will survive la. She managed to have a peek at Lot 61 "Lelong Corner". This is the place where they put those plants that need a bit TLC to rejuvenate them. There are plants 6 pots for RM10 and those 6 pots for RM20. Heard from many gardening members that they bought from the Lelong Corner and managed to nurse them back to life successfully. From Mamarazzi's untrained eyes, the condition of these plant not that bad at all. Some looks much better than those sold in hypermarkets. 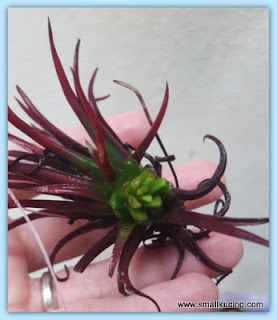 A sad note.... Mamarazzi found that something took a bite or many bite of her beautiful air plant. Ouch! 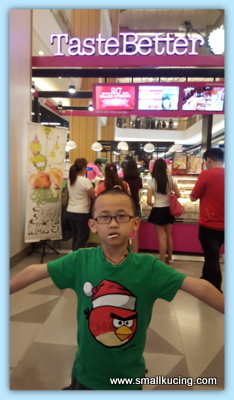 For me...aiya better go for this Durian Puff that Twilight Man highlighted in his blog. Don't eat Mamarazzi's Air Plant la or else she would turn into Indominus Rex lah. On a happier note....found seed pod on her jasmine. 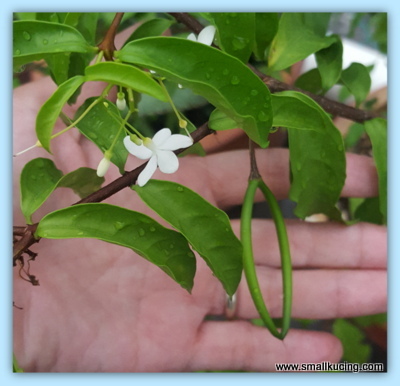 Yeah...this jasmine is easy to propagate via cutting but still...seeing seed pods is a happy thing. Thirsty Thursday.... Plants needs water. Human too. Drink more water ya. Should make a welcome mat... "Welcome, visitors! Don't eat Mamarazzi's air plant!" Hehe. Stevia plant is to eat issit? Hahaha.....doubtful that those visitors can read. The mandevilla blossom is very pretty! Look like the plants are growing well in the garden. I never see a jasmine's pod before. I like Jasmine. My mum used to pluck the flowers and put in a case for natural scent in the living room. Mamarazzi sure has green thumbs la... so rajin gardening. That pink flower is very beautiful. I would have bought it too. Durian puffs? Now I am craving for durian ice cream.. Ta ta!!! LOL!!! I am shocked that they do sell Bunga Lelongs!!! I must go look see. Hey you didn;t say whether you love that Durian Puffs? Every durian lover said better eat real durian. I know that but why people still make durian cakes, ice cream, coffee and cheese cakes? Innovative and variety mah! fulamak!!! this Mamarazzi terror lah, she knows all the names of the plants, the name of the plants look really like Alien Language to Uncle SK lah, hahaha!! in Uncle SK's dictionary, there is only two words to describe them - FLOWER or PLANTS.. just like all veggie is vegetables to him, hehehehe!!! Fuiyoh, so many flowers.. Macam-macam, now got this canggih flower pulak.. 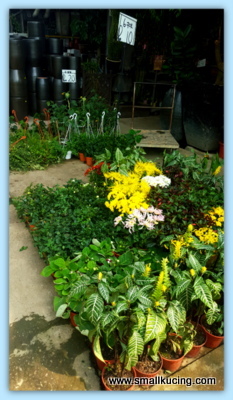 Ya la, see liao, nice, like wana buy all right..
Lelong corner at the plant nursery? Wow, I wonder any Ipoh nurseries having this lelong corner? I am sure can get some nice plants. Got to know about this from MG members. I put stevia in my tea but have never had a plant. Beautiful flowers....some of them grow in our state of Texas and do well. Oh and your post below...the fried rice, a favorite dish to serve here in our home. yea they like hot weather. Is the the Jasmine smell good? I grew stevia last year but it didn't last the winter. I even brought it in the house, but still... When it was growing, the leaves tasted like candy. I know Sg Buloh is the places where my mom always buy flower, but not sure is the same place as you mentioned or not.